Fantastic experience which will add tremendous value to myself and my business clients. They share their knowledge and insight with passion and incisiveness. A good insight into the whole process of Talent Dynamics was key for me in facilitating effective profile debriefs for the clients that didn't get it. Facilitating the creation of powerful and empowering Strategies that can rapidly increase flow. How to shift paradigms and actions in teams that are looking to see major shifts in business growth. The detail behind the 5 Talent Dynamics Energies and how they relate to Strategy. Recognising and enabling Leadership behaviors appropriate to the flow of the Enterprise. Understand how to create a plumbing system for a business that adds to the overall flow and is measured consistently. 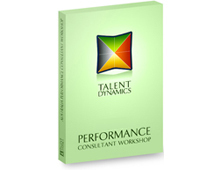 This workshop is open to accredited Step One Talent Dynamics Performance Consultants only. To find out more about becoming a Step One Performance Consultant, go here. A license to sell Talent Dynamics Step One and Step Two programs to your clients for a year. Full training manual with facilitators notes. A quarterly update to new materials, developments and sharing of best practice among the global community of consultants.